Sometimes I come across a recipe that has me lingering a few seconds longer than the others but yet for whatever reason, I pass it by. 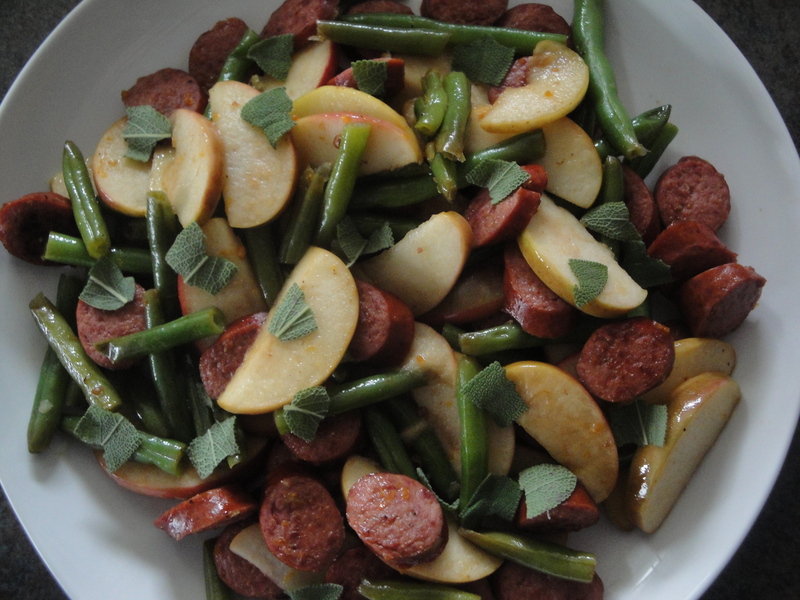 This recipe for Beer-Glazed Sausage and Apples is a perfect example of that. Each and every time I come across it, I pause and think Wow, that looks good. Finally, I caved. It won me over and I couldn’t go another day, another minute, without making it. 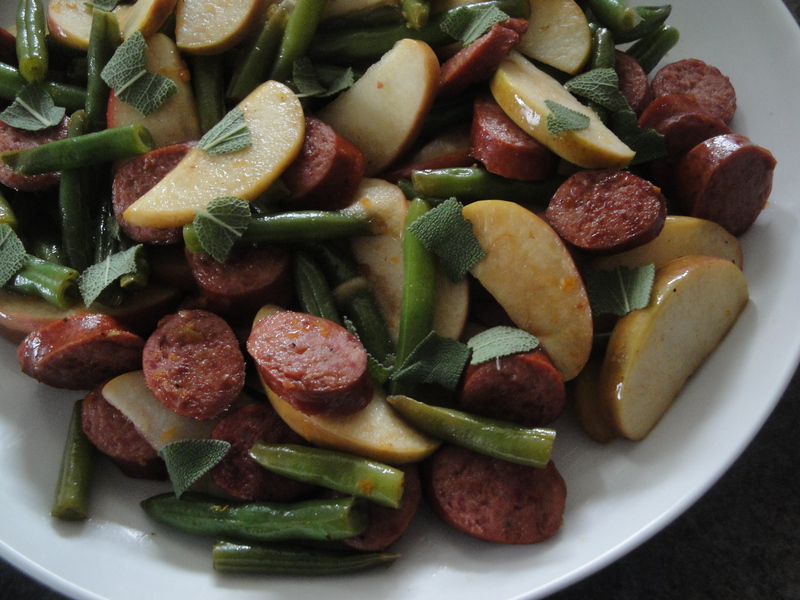 Smoked sausage (I used turkey) is mixed with apples and green beans and simmered in a flavorful broth of wheat beer, brown sugar, cider vinegar and orange peel before being topped with bits of fresh sage. The alcohol in the beer cooks off and the remaining flavor adds a layer of depth which blends so well with the sausage. 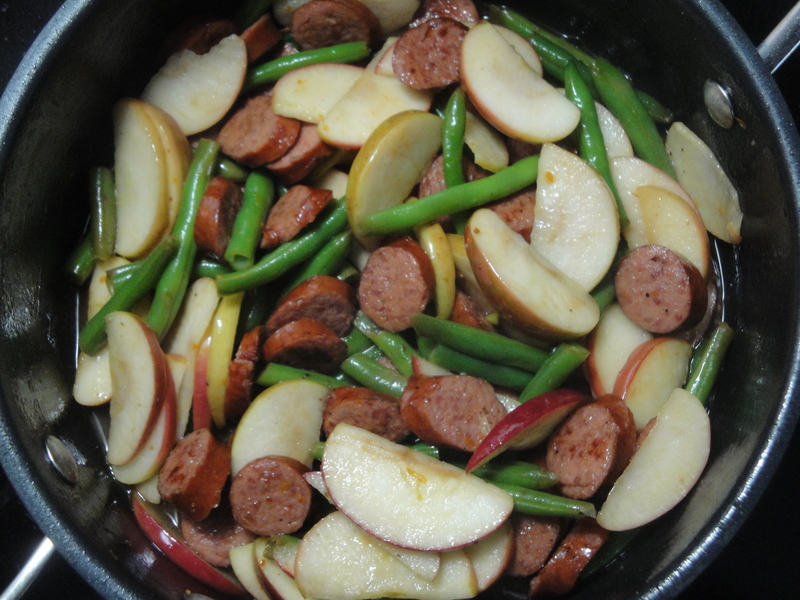 The apples and green beans are perfectly crisp while the orange peel provides a fresh, subtle citrus flavor which pleasantly permeates the whole dish. I had high expectations for this dish and the result was as good, no, better than I expected. 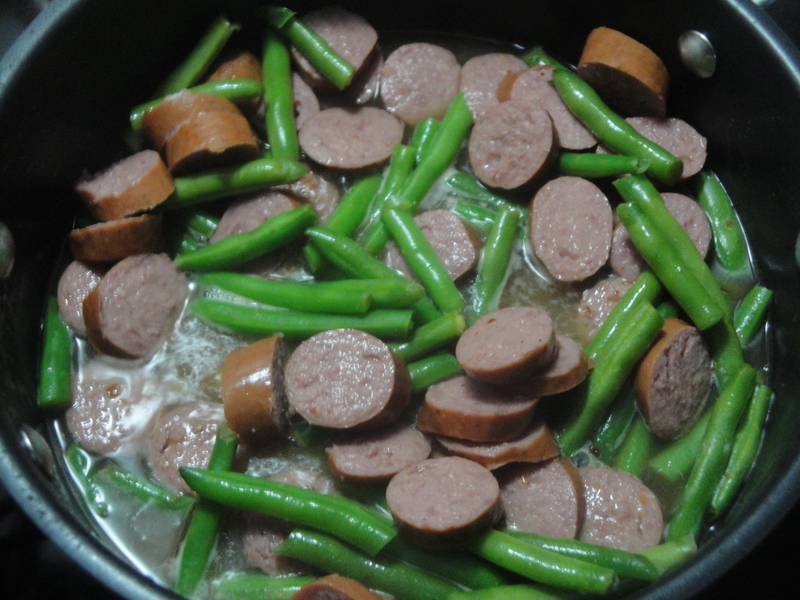 My only complaint: don’t boil the sausage with the green beans as the recipe states in step one (I think this is an error). Only boil the green beans in step one and brown the sausage in step three. And when you eat it, try to get a little bit of everything in one forkful. It’s worth a full mouth. 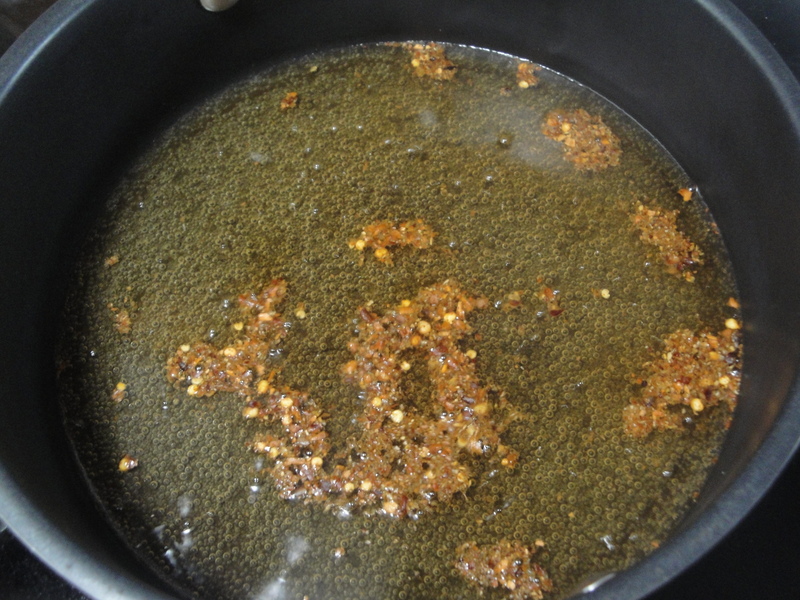 In a large saucepan combine 1/2 of the beer and the crushed red pepper; bring to boiling. 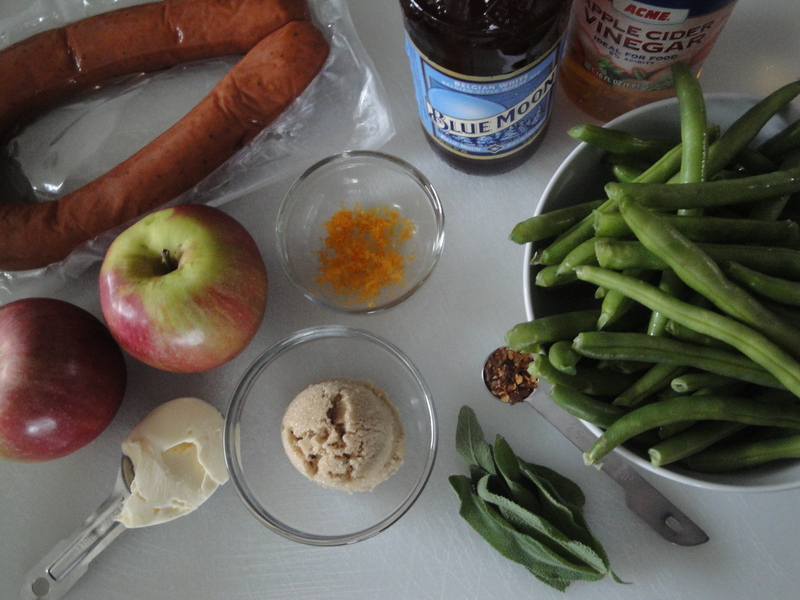 Add green beans (not the sausage). 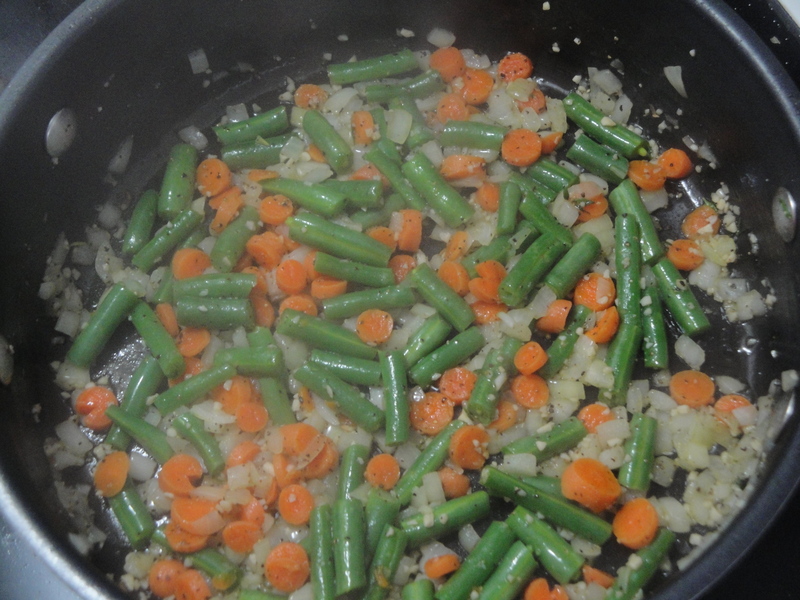 Return to a simmer, cover and cook 5 to 8 minutes or until beans are tender. Drain and set aside. 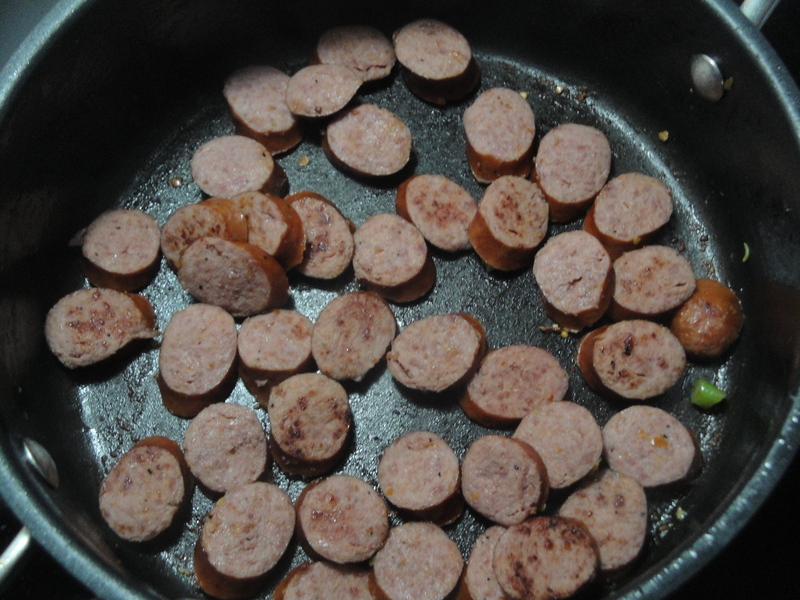 Add sausage to skillet. Cook, turning occasionally, until browned on all sides. Add to platter; cover. Drain fat from skillet. 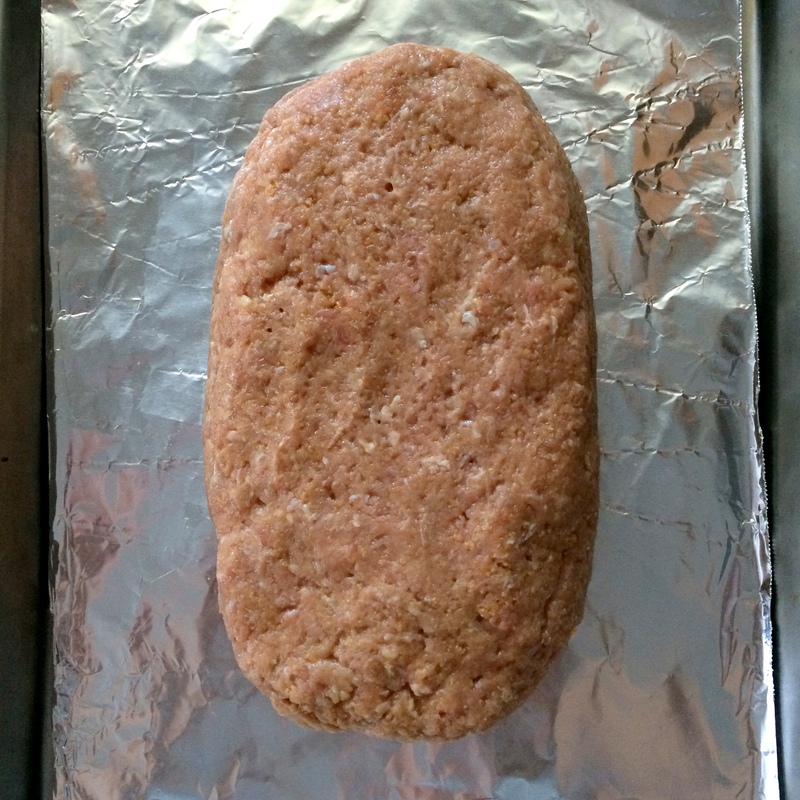 Carefully add remaining beer to skillet (mixture may foam); stir to scrape up browned bits. Add remaining 1 tablespoon butter, brown sugar, cider vinegar, and orange peel. 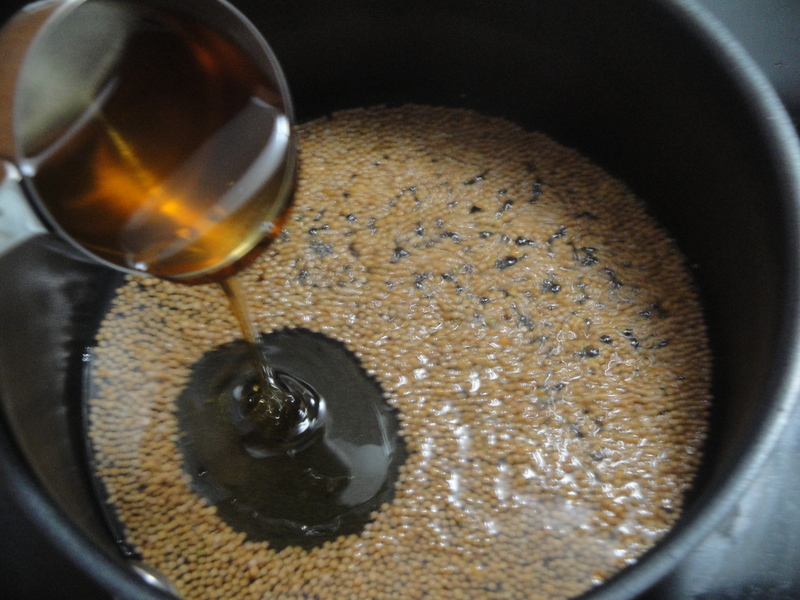 Bring to boiling; reduce heat and boil gently, uncovered, 5 to 6 minutes or until slightly thickened. 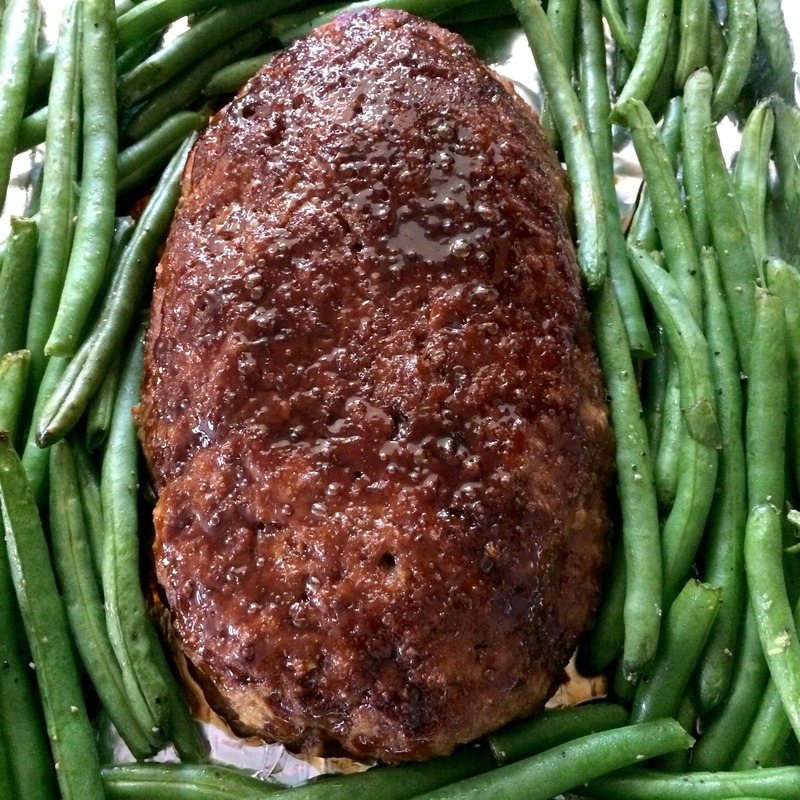 Return sausage and green beans to skillet to coat in glaze. 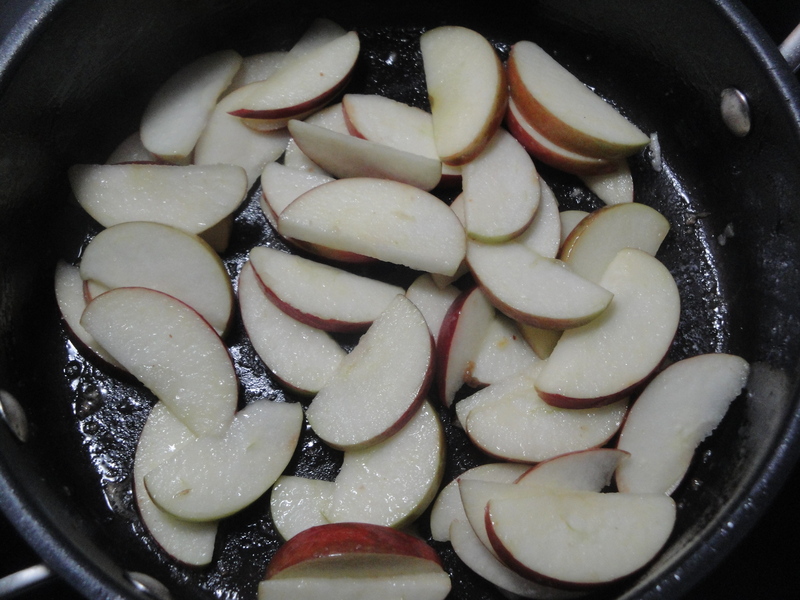 Fold in apples. Return to serving platter. Happy October everyone! October to me begs for two things: pumpkin anything and warm, bubbly soup. Oh, and Halloween candy. But…I’ve been trying to eat better lately and the key to doing that is to bring my lunch to work each day, stay away from fast food (and candy) and plan my snacks (hello fruit). One of the easiest foods for me to make when I’m trying to eat healthy is soup. 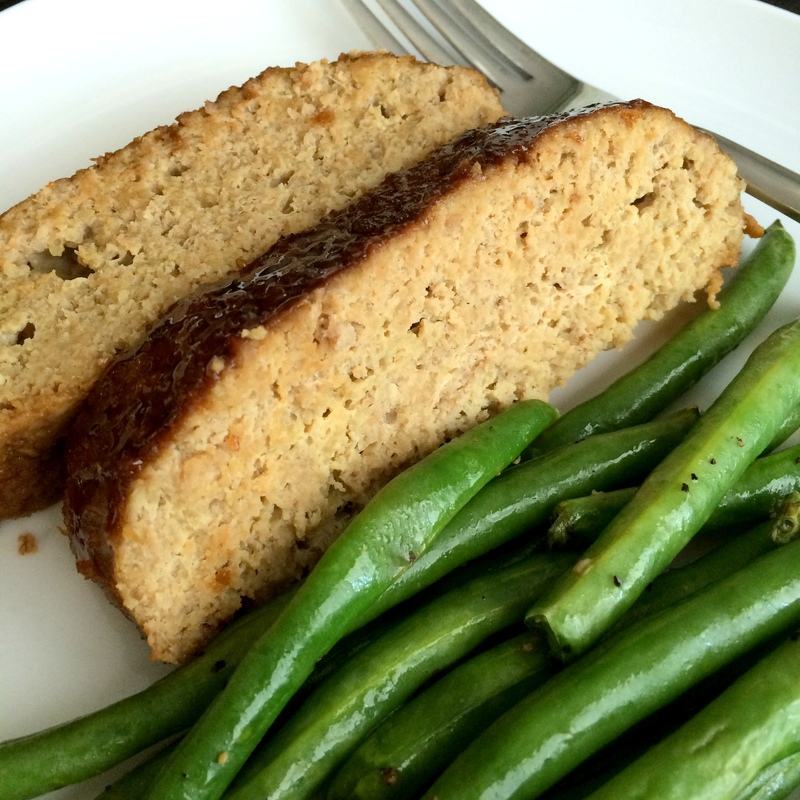 It’s usually low in calories, filled with veggies, packed with flavor and easy to bring for lunch. Not to mention that it’s usually a quick, one-pot meal. 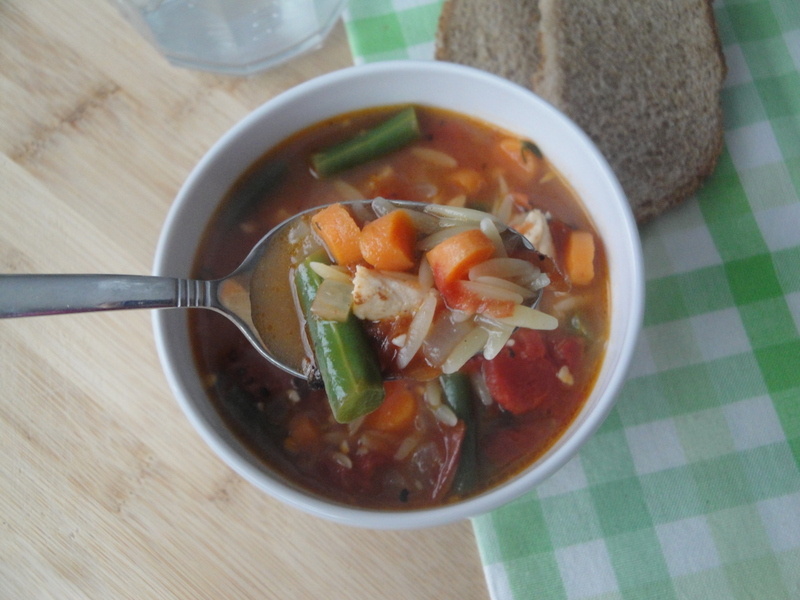 I made this Chicken and Vegetable Soup over the weekend which is a perfect grab-and-go lunchtime option. Made with rotisserie or pre-cooked chicken, the soup comes together in a flash and packs a flavor punch. 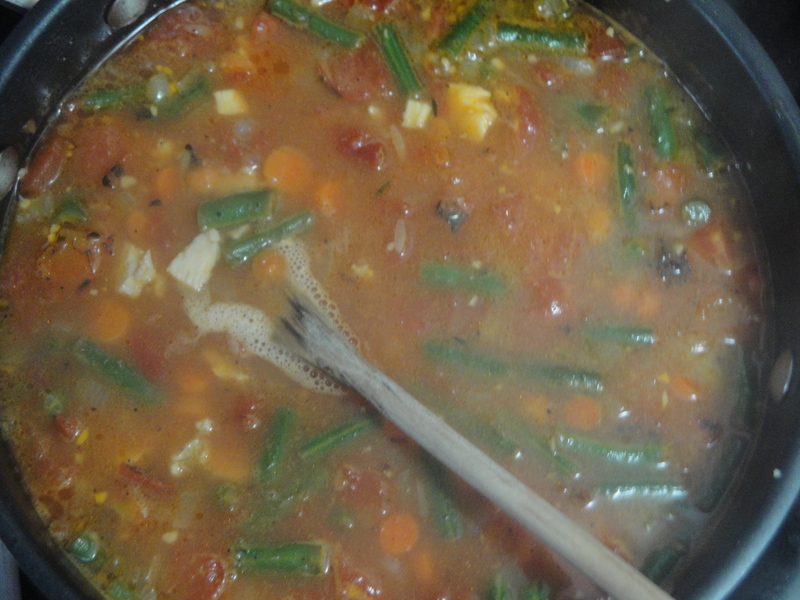 Fire-roasted tomatoes are the key to this soup which is mixed with broth, carrots, onions and green beans. 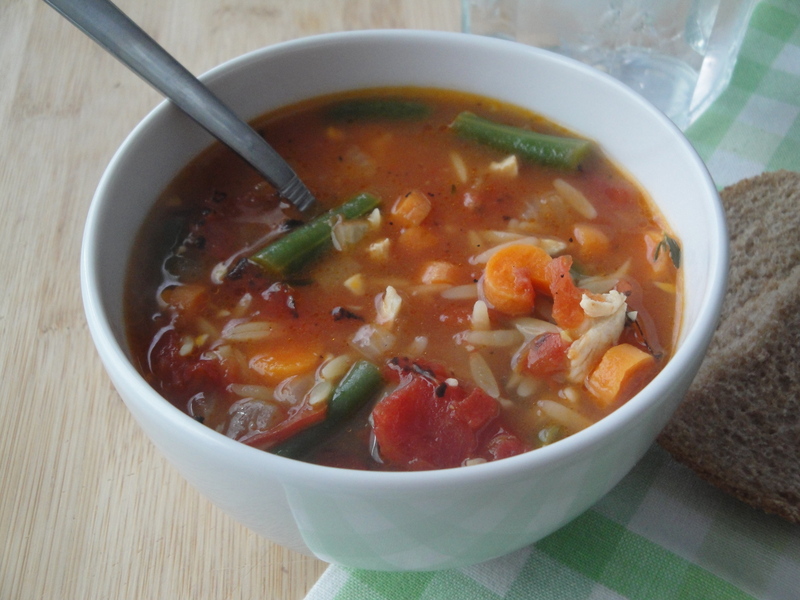 Chicken and quick-cooking orzo bulk up this soup which would also be great with spinach or mushrooms. 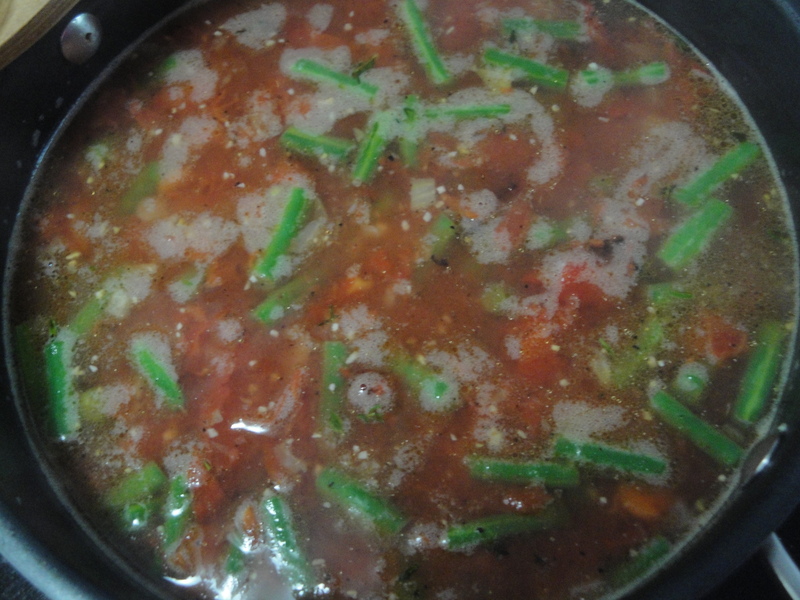 The vegetables are quickly sauteed (I added the green beans too early by accident) and become sweet which still retain their crisp and crunchy texture helping to make this soup hearty and filling. 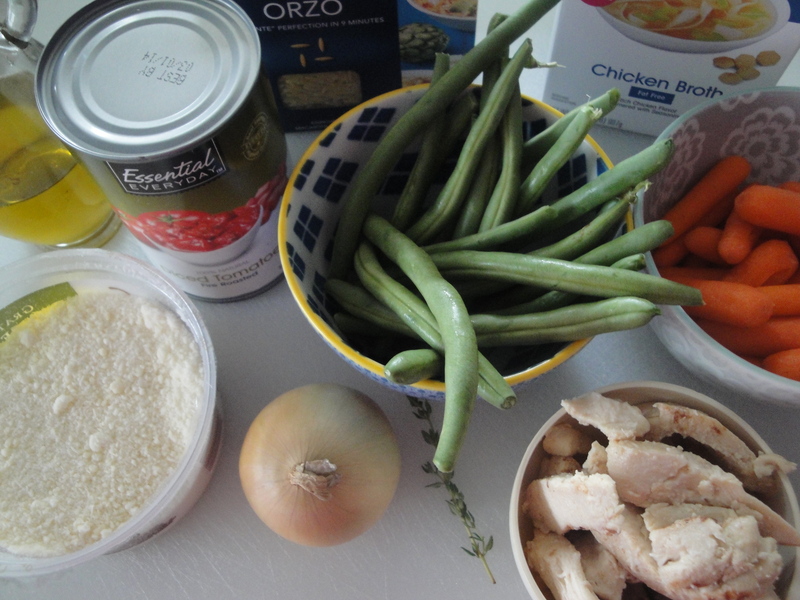 The orzo will plump up a little bit more as the soup sits so don’t worry if it doesn’t look like it’s not quite done. It will be perfect when you are ready to sit down and eat it. Paired with some fruit and baby carrots, this will be my lunch for the rest of the week. And I’m looking forward to it. Add oil to a Dutch oven heated over medium-high heat. Swirl to coat and add onion, carrot, garlic, salt, black pepper and thyme sprig; sauté 4 minutes. Add pasta and beans; cook 5 minutes. Stir in chicken, and sprinkle with cheese. Discard thyme. Top with additional cheese if you prefer. I love the produce section at the store in the summer because seeing bin after bin of $0.25 summer fruit and vegetables gets me slightly giddy. And even better, the produce is usually locally grown. I live in New Jersey, just outside of Philadelphia, and in the summers, markets and farm stands go crazy with tons of locally grown produce that you just can’t beat. Signs everywhere scream “Jersey Tomatoes!” or “Jersey Corn!” I bypassed both of these this weekend and instead headed for some locally grown green beans which I scooped up by the handful. 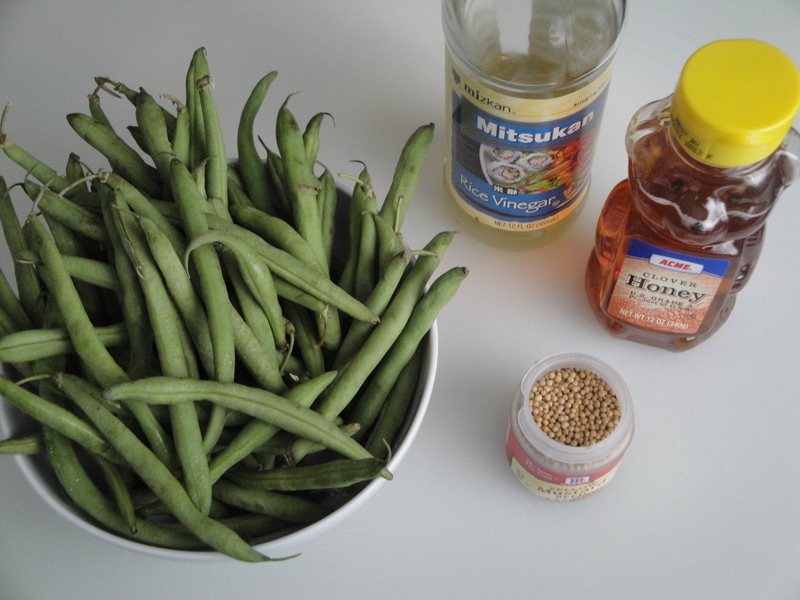 I didn’t really have anything particular in mind when I bought these so I can home, scanned my recipes and made Green Beans with Honey-Mustard Glaze. 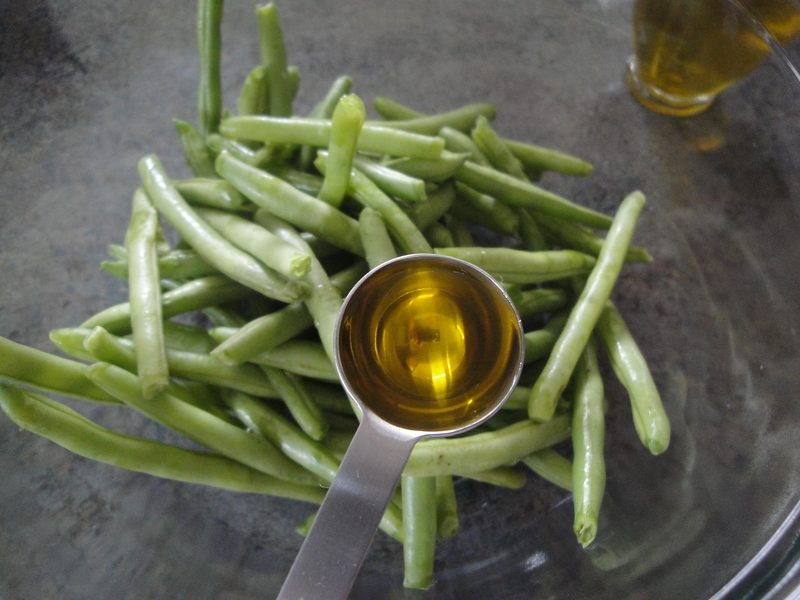 Fresh green beans are boiled until bright green, cooled, and tossed in a simple glaze of honey, rice vinegar and mustard seeds. 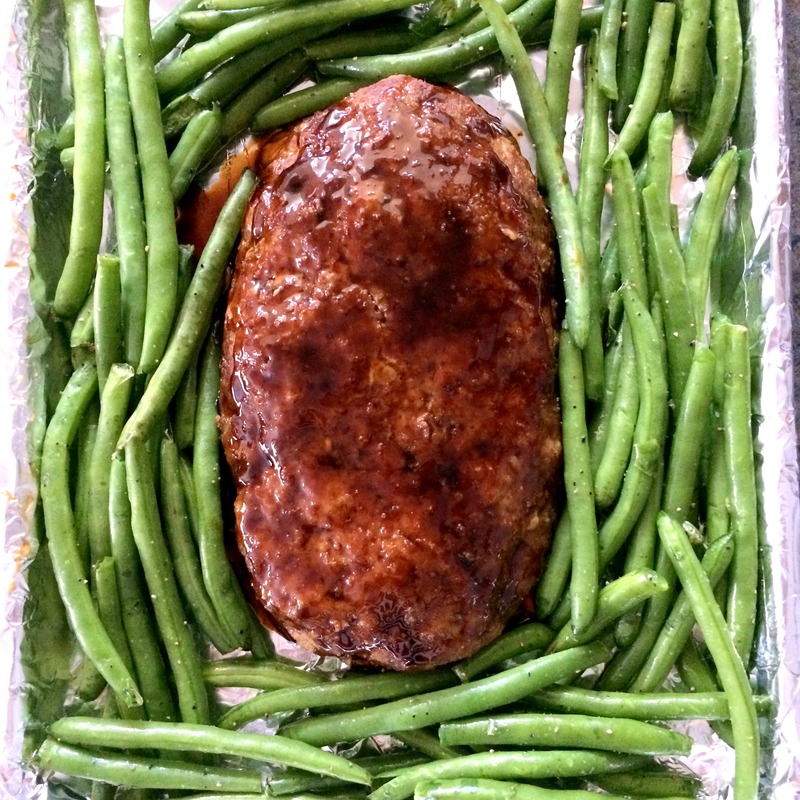 The result was perfectly cooked sweet and tangy green beans. 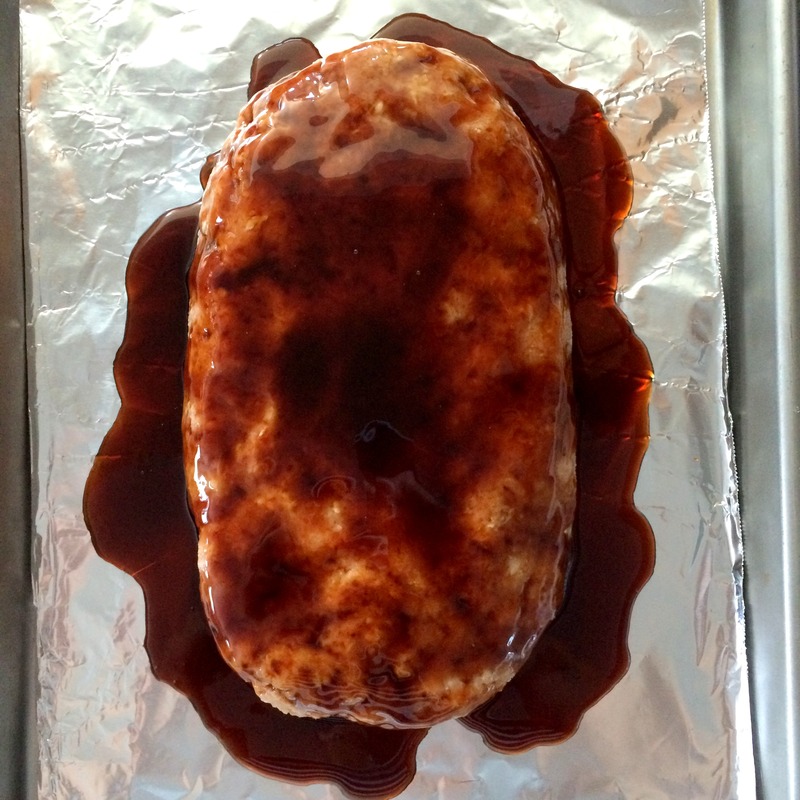 I have to admit though, as I was making this glaze, I thought Why in the world did I want to make this recipe? Smothering a vegetable in sticky honey isn’t really the most healthy way to eat, right? I ended up only using about a third (if not less) of the glaze on these beans (because either I didn’t make enough green beans or too much glaze was made) and actually, they were tasty. But I was still disappointed, mostly in myself. This is a typical case of me being too busy worrying about if I liked the ingredients in a recipe, rather than if I would like the end product. I like honey in my tea and on my biscuits. Not my vegetables. And especially not my locally grown vegetables. Consider my wrist slapped. 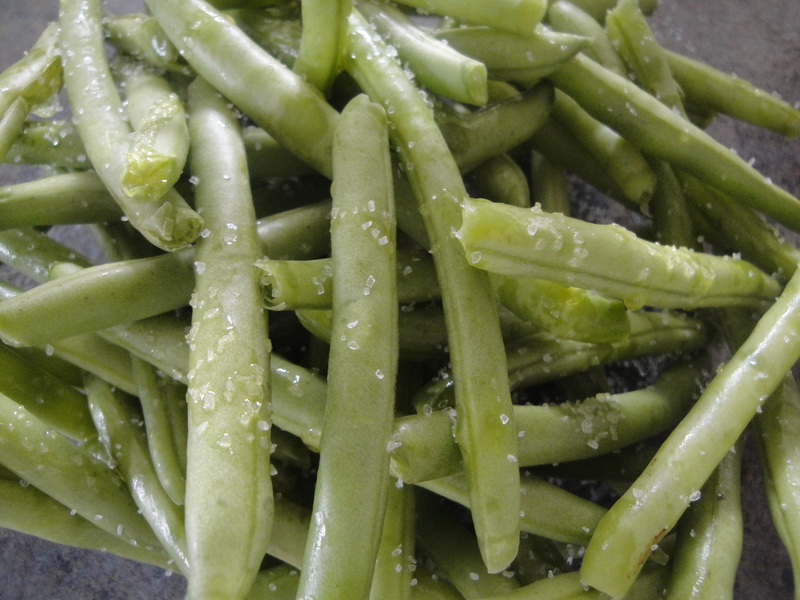 Bring a large saucepan of lightly salted water to a boil and drop in the green beans. Cook uncovered for 5 to 7 minutes or until tender but still crisp. Drain. 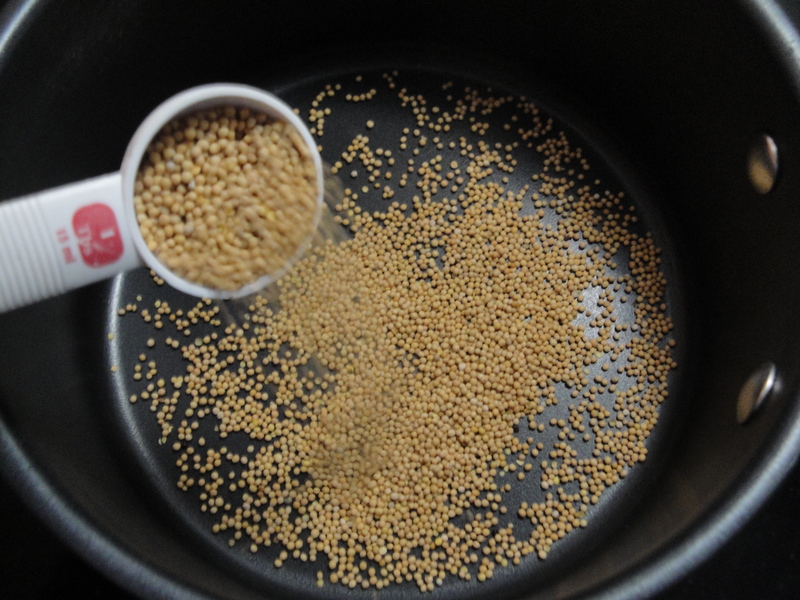 Dry the saucepan and return it to the stove. 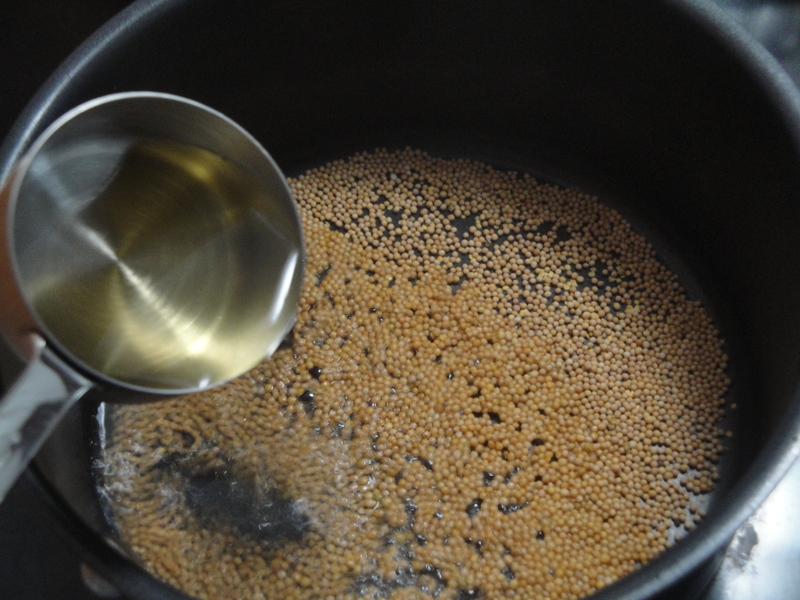 Toast the mustard seeds over low heat just until they pop, about 1 minute, stirring to prevent scorching. 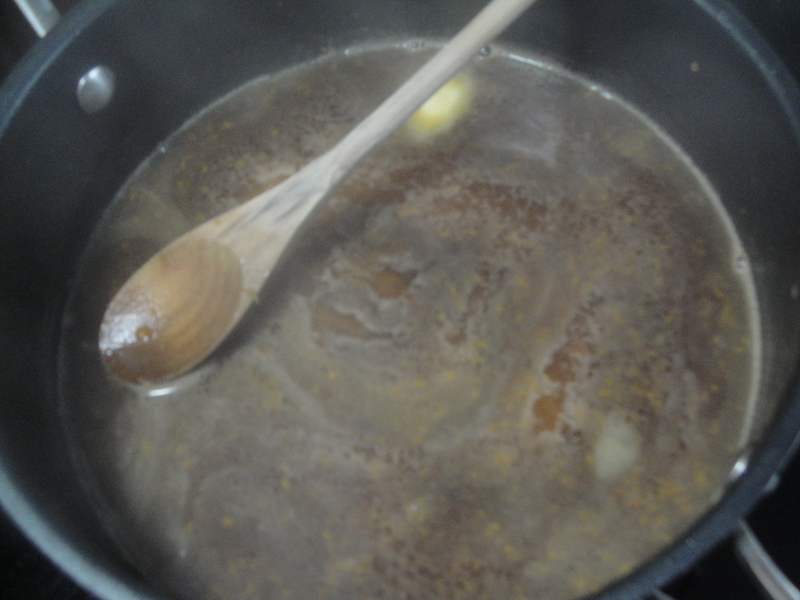 Add the honey and vinegar and cook until the sauce boils and becomes syrupy. 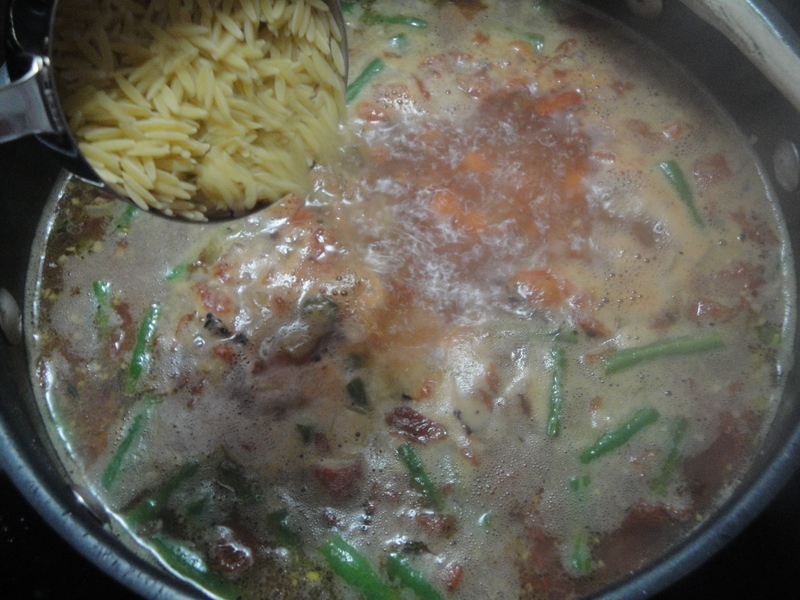 Add the green beans and toss. I’m a sucker for creamy, rich, mayonaisse-laden chicken salad. I love my own homemade chicken salad the best (which I will share with you one day) but I’ve been known to order fattening chicken salad in a restaurant from time to time. No matter how much I might want to eat it, I really try to watch my mayonaisse intake. Having grown up in Central Illinois where everything is made with mayonaisse, this used to be more of a task than it is now. (My dad used to make his own salad dressing with mayonaisse and sugar – ugh!). 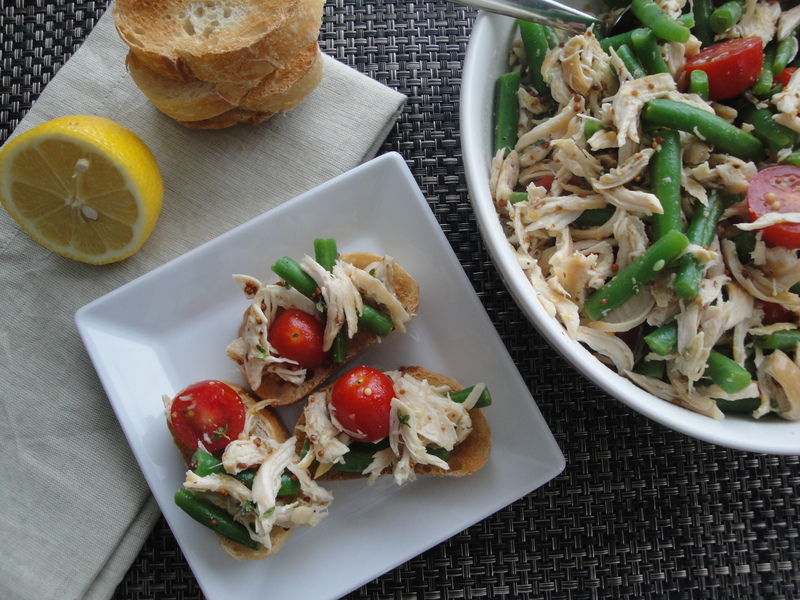 After falling in love with and devouring Cooking Light‘s Avocado Chicken Salad, I couldn’t resist trying the mayo-free Chicken and Green Bean Salad. 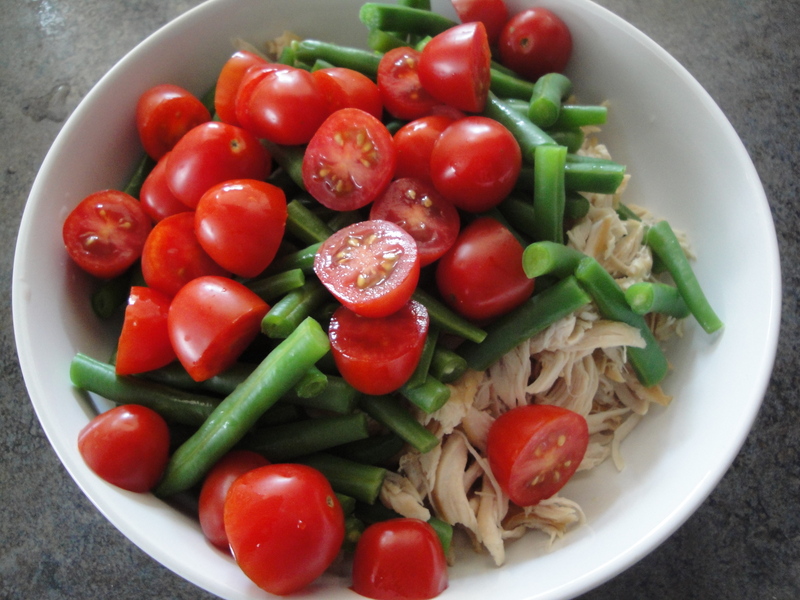 Steamed green beans are mixed with chicken and grape tomatoes and then tossed in a light mixture of olive oil, lemon juice, whole-grain Dijon mustard, and fresh thyme. 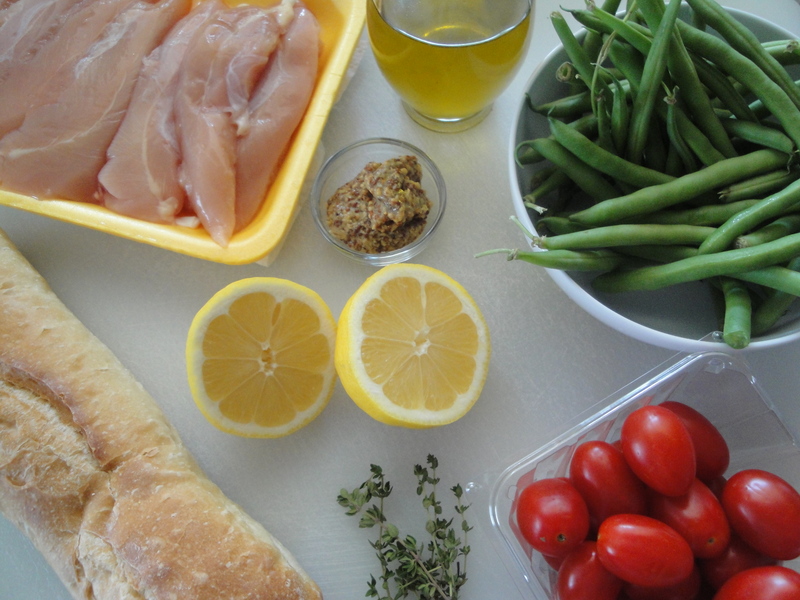 If you don’t have whole-grain Dijon, regular Dijon will work (it just won’t look as pretty). The recipe calls for cherry tomatoes but I used grape tomatoes (they are smaller and fit onto the baguette slices better). I also quickly grilled up chicken tenders which I shredded with a fork but using rotisserie or precooked chicken will speed up the preparation. 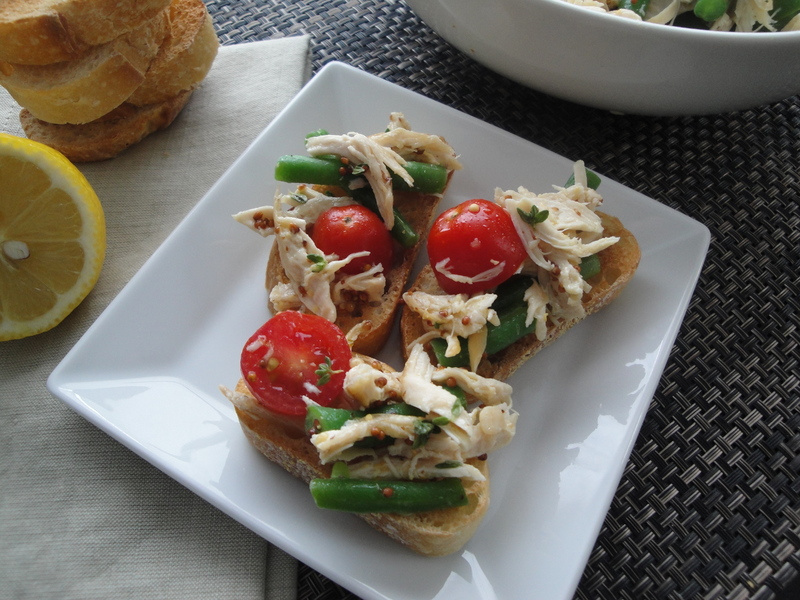 Seasoned with salt and pepper, this chicken salad is a great option to take to a picnic or outdoor event. Serve with toasted baguette slices, whole-grain crackers or over a bed of baby spinach and you’ve got yourself a dish good enough for lunch, dinner or as an easy appetizer. And I bet you won’t even miss the mayonaisse! 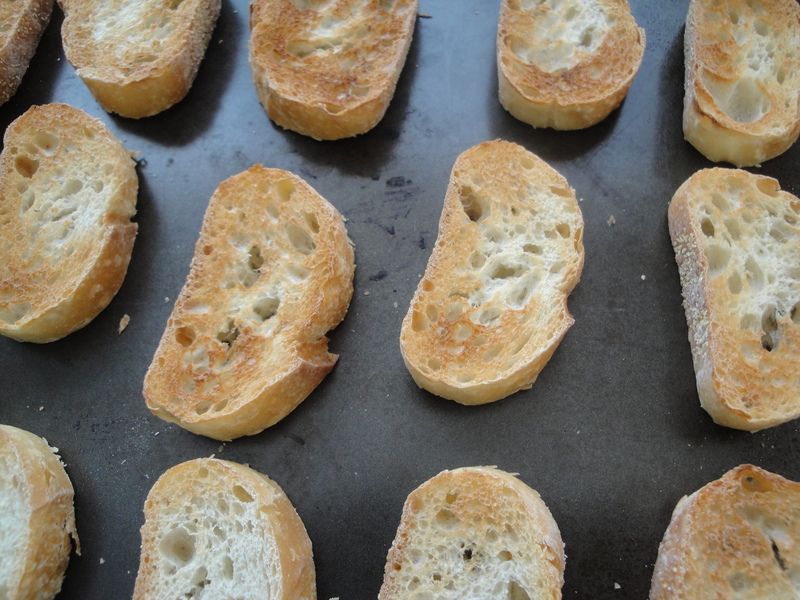 Arrange baguette slices in a single layer on a baking sheet and broil in the over for 1 minute or until toasted. 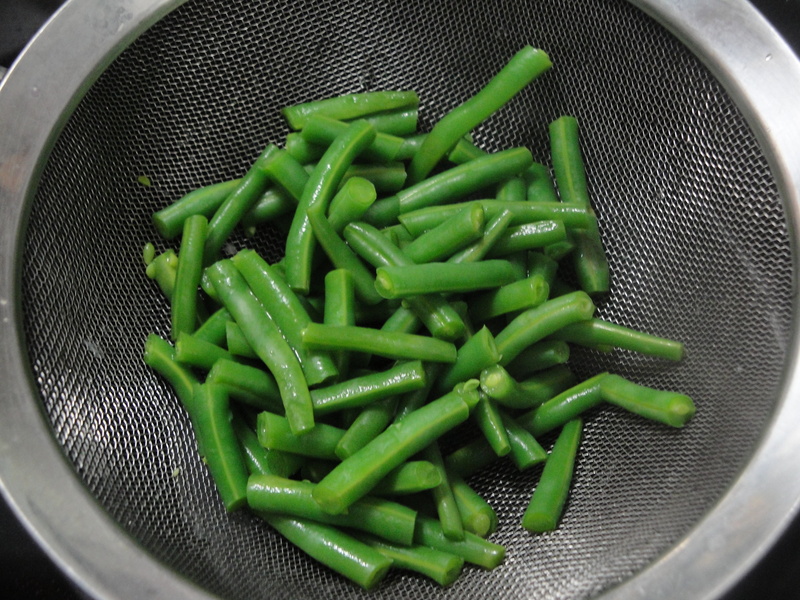 Steam green beans 3 minutes or until crisp-tender. Drain, rinse with cold water and drain again. Set aside. 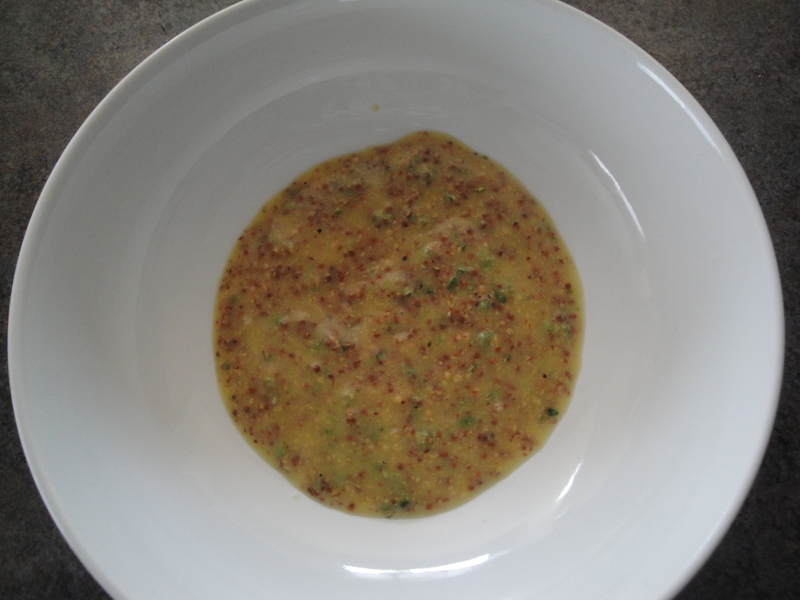 In a large bowl, combine olive oil, lemon juice, Dijon, thyme, salt and pepper with a whisk. Add chicken, beans, and tomatoes to dressing mixture and toss to combine. As I mentioned a few days ago, I’ve got an Asian-inspired veggie which makes for a really tasty side dish. Since I’m pretty picky when it comes to veggies, I’m always looking for different ways to prepare the ones that I like so I don’t get so bored with them, I give up eating them altogether! 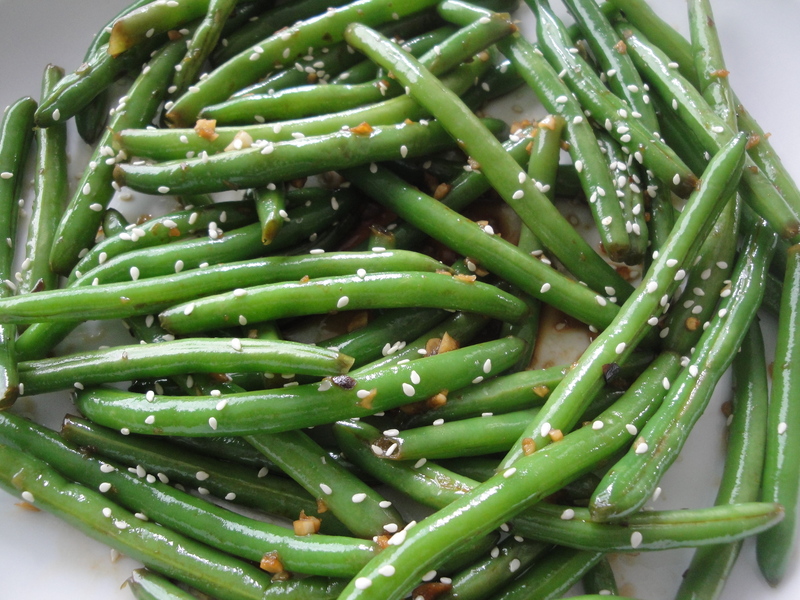 What a better way to liven up some green beans than with a little bit of salty soy? 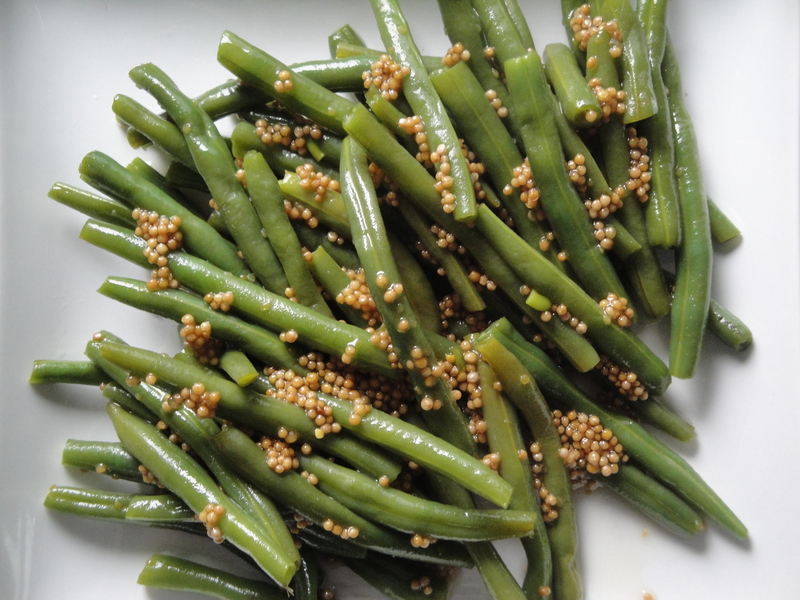 That’s exactly what these Sesame-Soy Green Beans are. 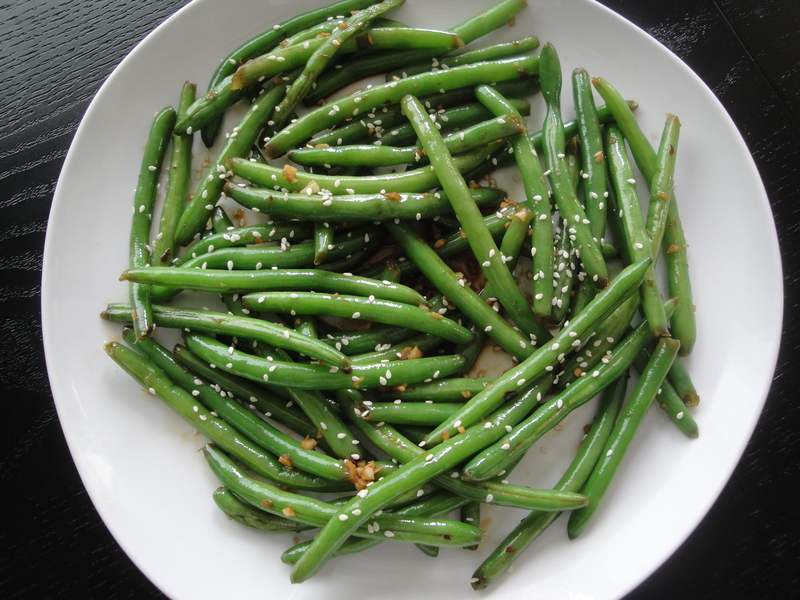 Bright green beans are cooked and tossed with a mixture of soy sauce, garlic, and red pepper flakes before being sprinkled with nutty toasted sesame seeds. I don’t know what it is about the combination of soy sauce and garlic but if you put in in a martini glass, I just might drink it. But I digress…I love bagged veggies (even if they are a little more expensive) because it just helps speed things up but use whatever green beans you like here. Consider this preparation with other veggies too, like broccoli, cauliflower, asparagus, spinach or brussel sprouts. Yum! 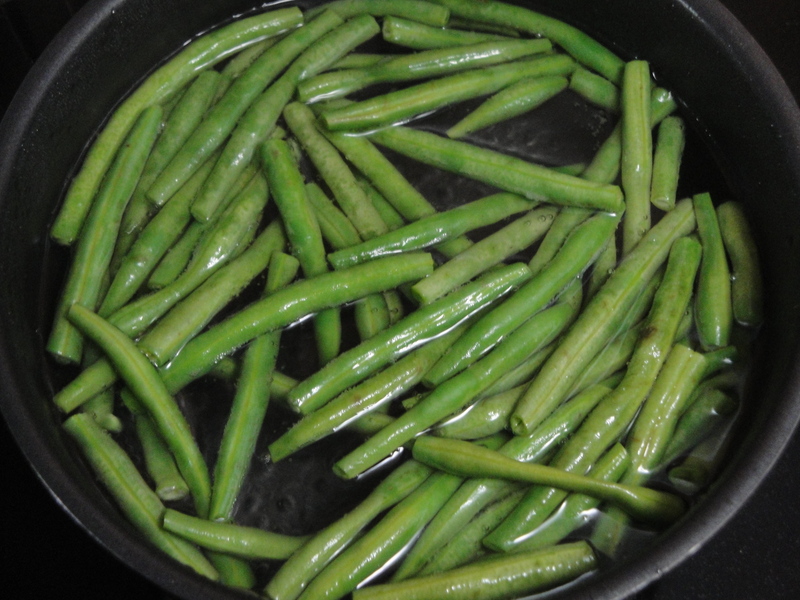 Prepare green beans by either cooking in a microwave according to package directions or on the stove (cook in boiling water for 5 minutes). 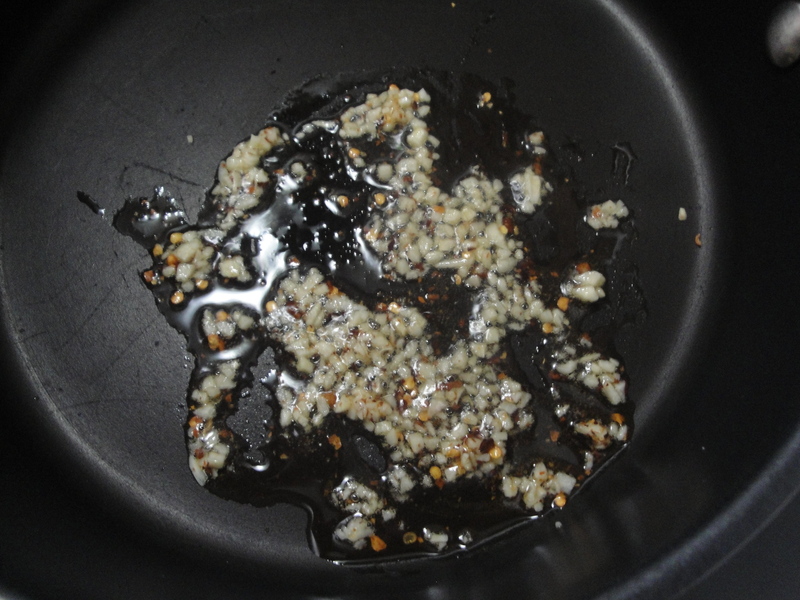 Sauté garlic and red pepper flake in sesame oil in a skillet over medium-high heat for 30 seconds. 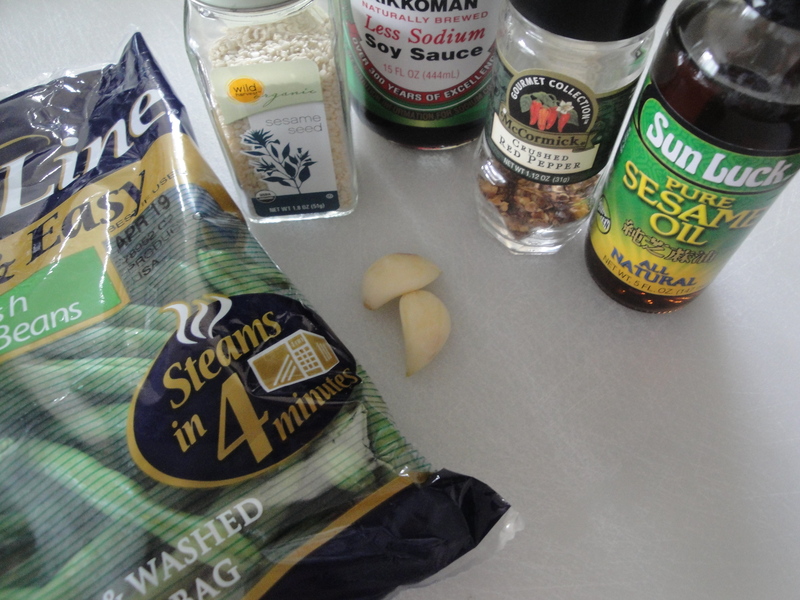 Add green beans, soy sauce, and salt; cook 2 minutes, tossing frequently. 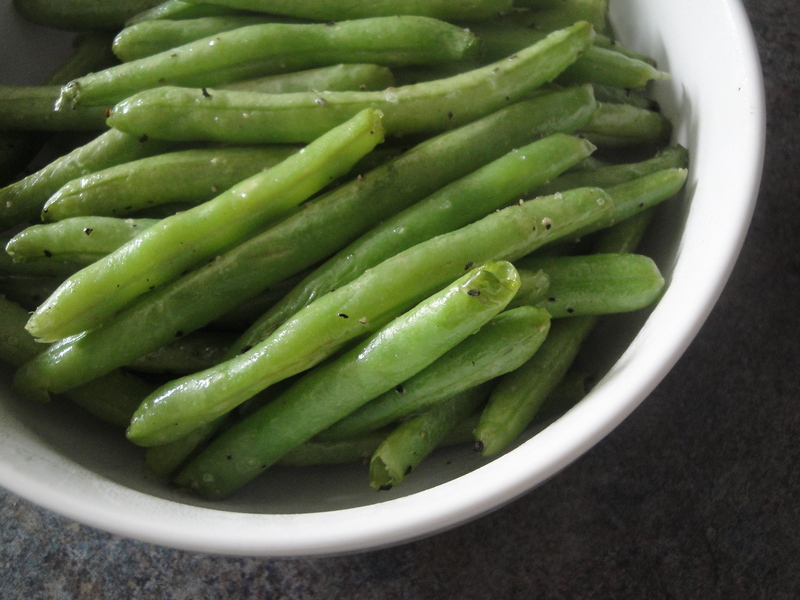 I’ve become a big fan of fresh green beans. 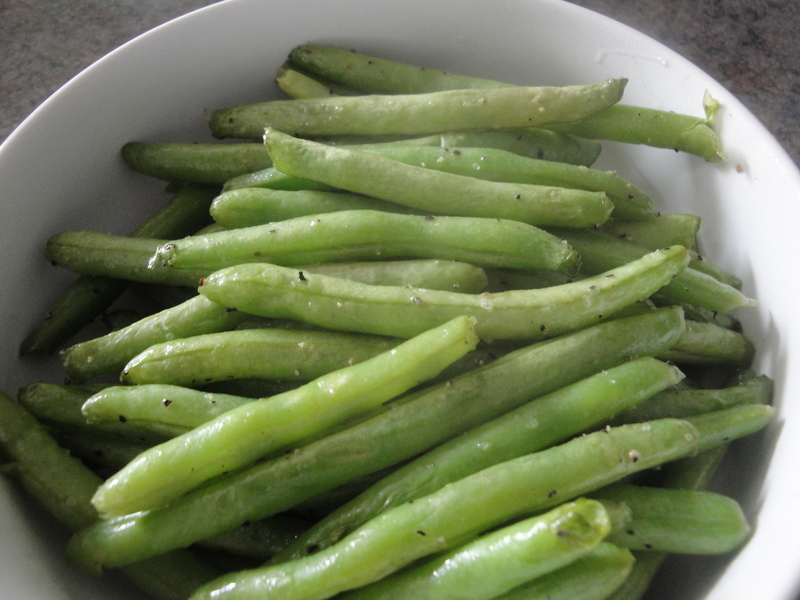 I remember eating canned green beans a lot as a kid and now I won’t even touch them. 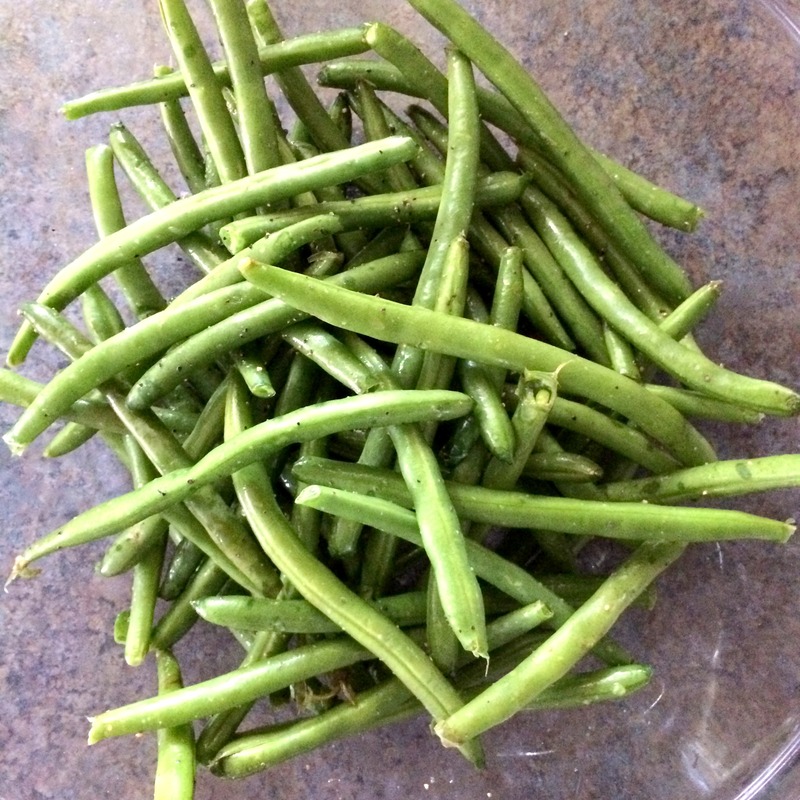 Fresh green beans are so much better and now that most grocery stores carry steam-in-bag green beans, they can be made in no time. 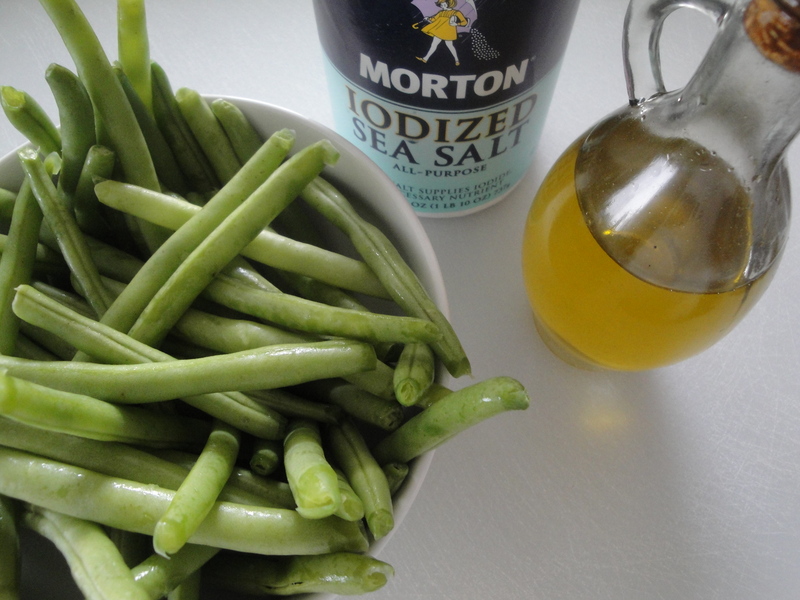 I never thought about roasting green beans until I came across this recipe for Oven-Roasted Green Beans. 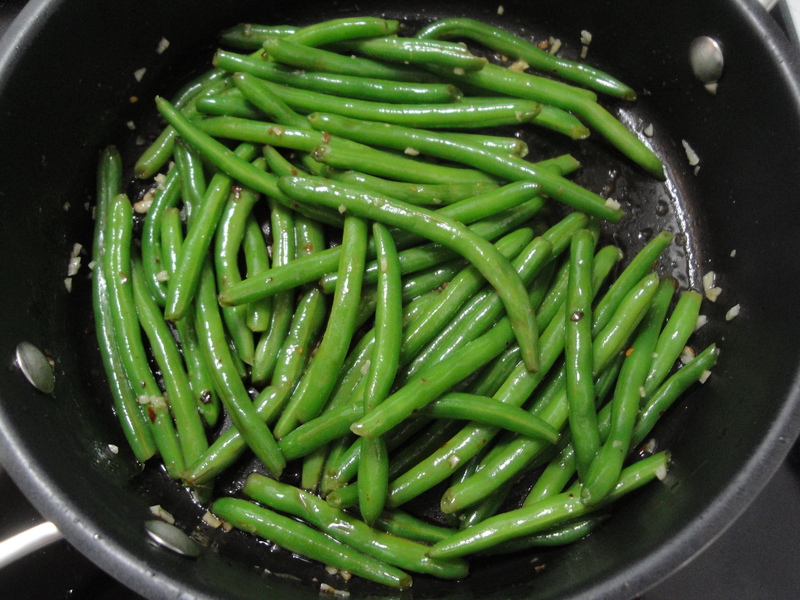 Fresh green beans are tossed with olive oil, sea salt, and black pepper and roasted in the oven for 8 minutes. 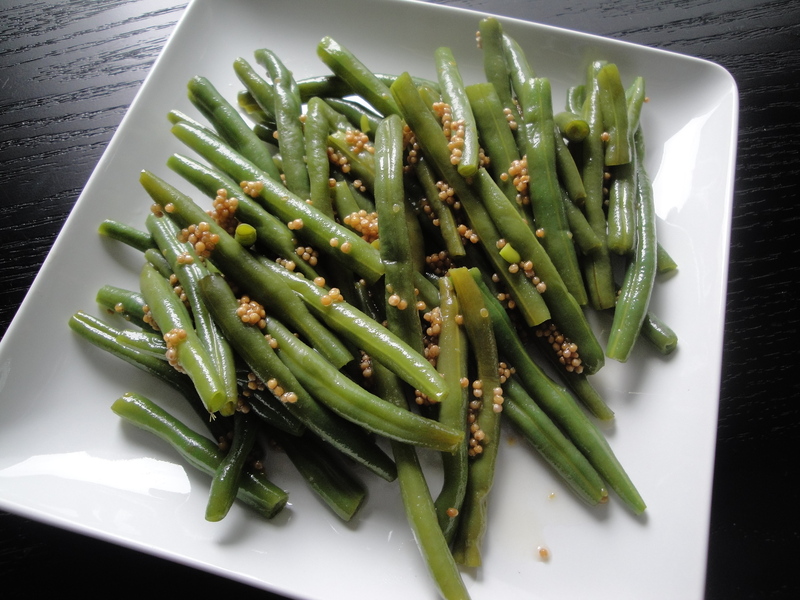 The green beans come out so crisp and flavorful that they will complement any meal. 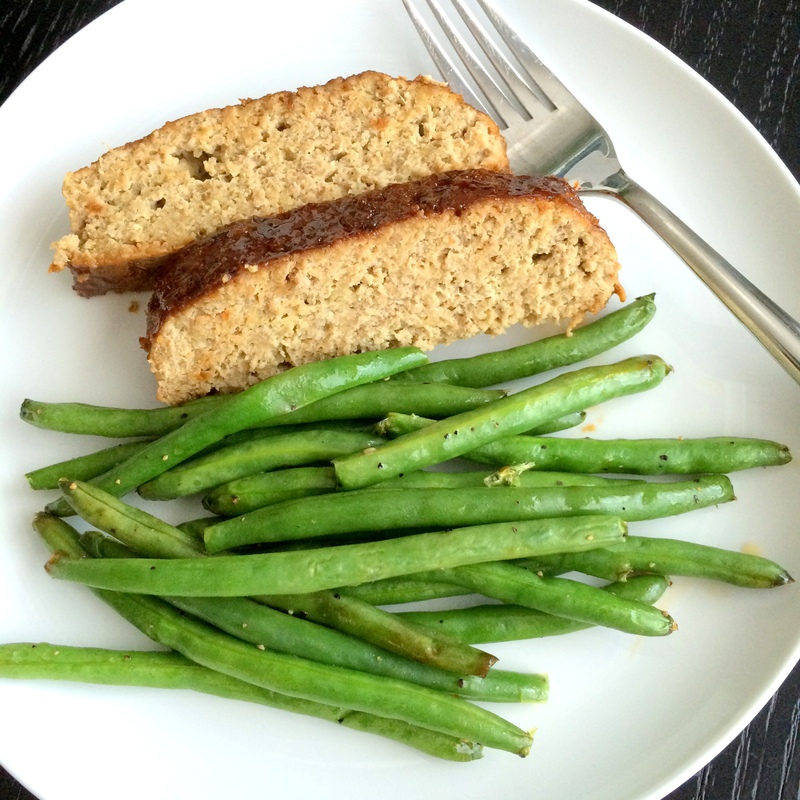 These don’t take much longer to make than microwaved green beans and they are so much better! 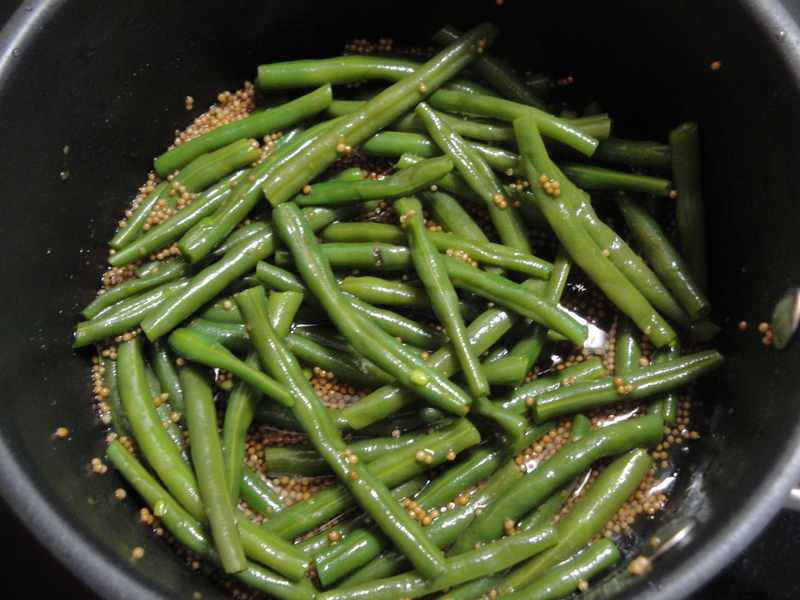 Place trimmed green beans in a large bowl and drizzle with olive oil. Sprinkle salt and pepper over the beans and toss until all the beans are seasoned. 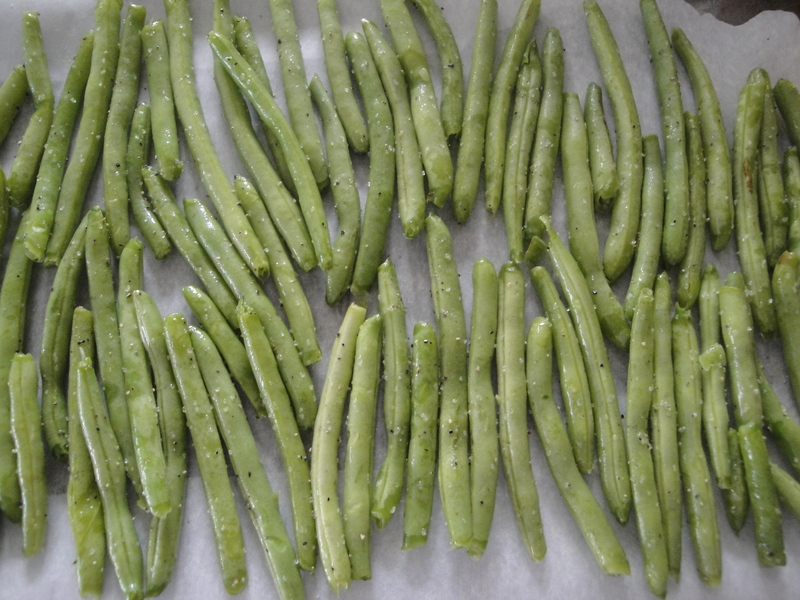 Lay the beans flat on a baking sheet and roast in a 425°F oven for 8 minutes.